Disclaimer: I received a complimentary copy of this book from Schiffer Publishing Ltd. via NetGalley in exchange for an honest review. As an amateur fairy gardener myself (my daughter and I have battled possums, chickens and the neighbour's cat to create and maintain a humble little fairy in a large flower pot) I was entranced by the beauty and diversity of the fairy gardens and houses in this book. They range from simple little ceramic homes to multi-level gardens with bridges, ponds and other decorations and elaborately carved little castles with turrets and staircases. Some of these even have coloured glass windows and can be illuminated at night. Many are created using recycled materials such as twigs, driftwood and old furniture and cookware. My personal favourite is made from an old samovar. There are even fairy houses made from living flowers and funghi. In addition to the illustrations of the various fairy homes and gardens and information about their designers, there is a section about Skyland Trail, a non-profit program in Atlanta, Georgia designed to help adults recovering from serious mental illness. Skyland Trail uses the creation of fairy gardens as a form of therapy. 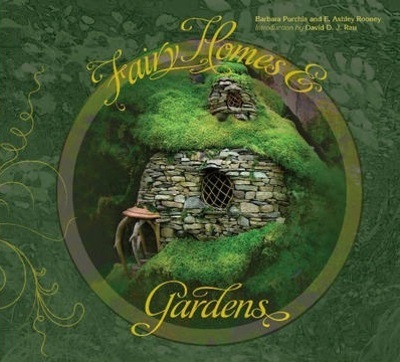 The authors, stained glass artist Barbara Purchia, and writer, E. Ashley Rooney have created created a beautiful book to delight gardeners and fairy lovers alike.The pictures provide endless inspiration for creating your own fairy garden for children to play with or adults to admire.